Pee Puck : The NEWEST, FUNNIEST gag joke product on the market! Just released and taking the prank world by storm. Whether you're at home, at a friends or at the office, PeePuck gag gift provides days of laughter, frustration and confusion for all. 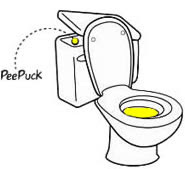 PeePuck is a specially designed puck that’s placed in the toilet reservoir, making the toilet flush yellow for days. Imagine flushing your toilet, then coming back two minutes later and the water is still yellow. What happens next? As the back side of the package reads “Mom will be pissed, Grandma confused, and your workmates laughing!”. PeePuck is now available worldwide for pranksters of all ages. My Pee Puck came just before April, First. Just in time for the famous "April Fools Day" .. My husband was I'm sure expecting some kind of gag from me that day, so to surprize him I pranked him a day early. I'm constantly nagging him about not flushing. It's like it's built into boy's mind's to pee and leave it, and they carry it on into man hood. Well I guess I have nagged my Husband enough that he hardly ever not flushes. Once in a great while when he is in a hurry he does. I guess I can say I have him "Potty Trained".. A little toilet humor for you. I was so excited when my Pee Pucks came in the mail. I couldn't wait to try them. As a little kid I grew up in a family who was constantly pulling a prank on someone in the house hold. Now to this day my family still tries to out do each other even if it isn't april fools day. One pee-puck in the toilet reservoir provides days of yellow flushes! : I loved how easy it was to pull off this prank! It was easy as lifting the reseroir lid and dropping it in! (Do not remove pee puck packaging) The pee puck activates on it's own after a couple of hours, and provides days of fun!.. The toilet water is STILL yellow even after pulling the prank. (Which was and still is funny) .. You will get a kick out of pranking the ones you know, and will even try to see how many you prank. This is a funny gag gift, but would be even funnier if you went to a restaurant, and dropped one of the Pee Puck's into the public restroom. Prank as many people as possible without them even knowing what's going on. You will hear the toilet continue flushing, over, and over again. But you will be the only one knowing the joke. I have a ton of ways I could use the pee pucks, (Remember this is a harmless joke) please don't take it to the extreme. 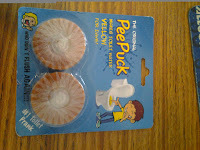 The Pee Puck's make an awsome little gag gift for someone that you know that loves to prank or loves funny collectables. Mom will be PISSED, Grandma CONFUSED and your workmates LAUGHING. ♥ I receive no monetary compensation for this review. I was provided a Pee Puck to try and give my honest opinion.